The Laser 3D scanner technology developed and patented by the University of Girona is one step beyond the state of the art of underwater 3D perception. It is the result of a PhD thesis in Underwater Robotics and 3D Perception done by Albert Palomer and tutored by Pere Ridao, Josep Forest and David Ribas that will be soon defended. L3S, as an easy to integrate system, will allow the end user to gather online 3D information of a target scene from a moving vehicle at a resolution where the objects can clearly be identified. Moreover, it will also allow the user to have a more accurate idea of the inspected area at a very high resolution,at the cost of a longer scanning time, being able to detect cracks from 1mm, find targets, support on the assisted operation of autonomous intervention tasks, quantify volumes,… covering real market needs. This technology is currently on a valorization process and one of the first steps towards the market was the participation of the L3S team in a Robott-Net voucher and a license agreement with the company IQUA robotics. 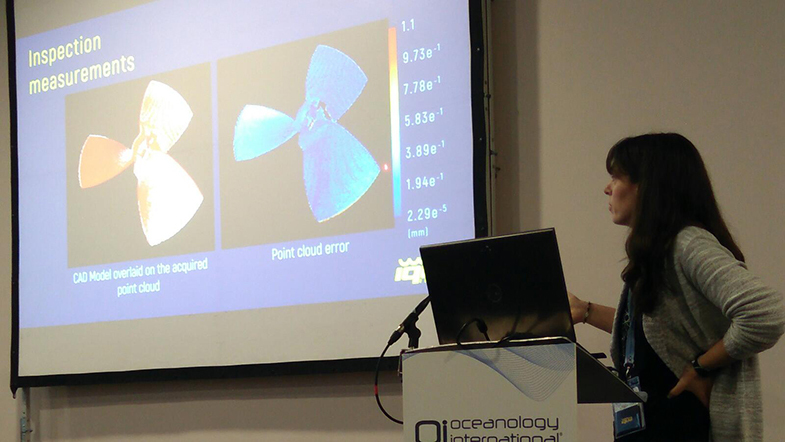 The technology was presented in the Oceanology International as part of the IQUA portfolio for the year to come.